Because of its huge collection of music videos, YouTube often serves as a good alternative to music streaming services. But the official YouTube app has one major caveat, which prevents it from providing a complete music streaming experience on mobile devices. The limitation we’re discussing here, is of course the lack of support for background playback. Before iOS 10, there used to be a simple trick for playing YouTube videos in background, on iPhone and iPad. 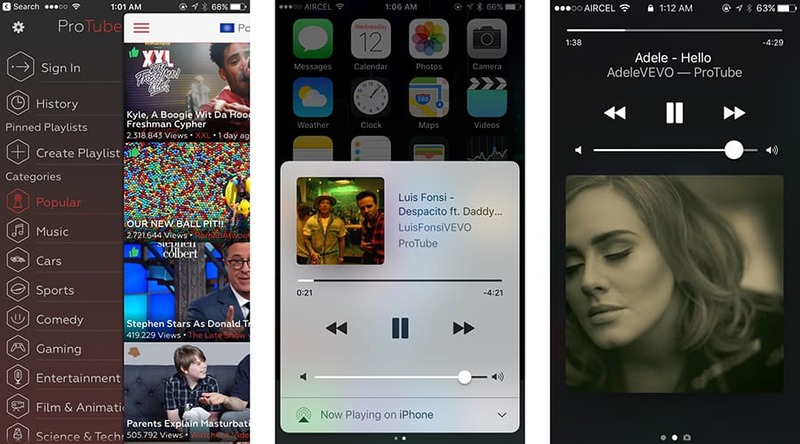 After playing a particular track on YouTube website using Safari, one could continue playing the track in background from the media controls in Control Center. But this feature has since been discontinued. So, we’re now left with third party alternatives instead, to play YouTube videos in background on iOS devices. Here, we have listed down a few third party YouTube apps for iOS, that support playing videos in background on the lock screen as well as while using other apps. ProTube is a full-featured YouTube client, that provides a polished, ad-free experience. Along with regular YouTube features, it includes support for background playback, audio-only playback, adjustable playback speed, etc. You can select the video playback quality, all the way up to 1080p @ 60fps and 4K, if available. For optimal music streaming experience, ProTube’s audio-only playback enables you to listen to high quality audio tracks, but being low at bandwidth consumption at the same time. The background playback feature allows you to keep playing ProTube in background, while you browse other apps. Quick access to media controls from the Control Center allows you to be in control of your playback. Apart from background playback, the app also allows you to minimize currently playing video, so that you can browse through the other sections of the app, while the video continues to play in Picture-in-Picture (PiP) mode. ProTube lets you log in to your YouTube account and access your liked videos, subscribed channels, watch history, etc. It can notify you about new video uploads from your subscriptions as well. ProTube can be downloaded from the App Store for $3.99. EverTube is a free YouTube client for iOS devices with support for background playback. It provides a full YouTube experience, complete with category browsing, Trending videos and Most Shared section. You can switch between different regions to access content across the globe. Logging into your YouTube account allows you to add your favourite videos, access watch history, add to watch later, create playlists, and much more. A particular area in which EverTube excels as a video player for YouTube, is its enhanced playback controls. The app allows you to shuffle & loop through playlists, and even control the playback speed. Additionally, it also has a special Night Mode for those who prefer dark UI. EverTube is a free (ad-supported) app available on the App Store. You can also upgrade to a Pro version of the app for ad-free experience, via in-app purchase. Musi is a simple iOS app that allows you to play videos, build custom playlists, and organize music collections from YouTube, without requiring a YouTube account (though you can login if you want to). Musi does not help you navigate YouTube as you would on the official app or website, but rather allows you to search for videos & play specific custom lists. You can stream music from the app to an AirPlay enabled device, or import playlists shared on Musi using the unique playlist identifier. The app supports background playback, allowing you to stream videos from the Home screen or from other apps. Musi is available as a free download on the App Store. If you have come across any other apps worth mentioning in this article, give us a shout in the comments below.